With a series that has spanned well over two decades there are bound to be a number of titles out there that come in under the radar that most fans don’t know of. No, I’m not talking about a handheld game like the Oracle of Seasons, in which many Zelda fans have not played. I’m talking more along the lines of the Legend of Zelda Game and Watch. Our friends over at ZeldaPower have put together a handful of pages at their website, with everything from an Artwork Page, Music Downloads, Gameplay Videos, and more! Here is a tidbit from their recent news update discussing the game. 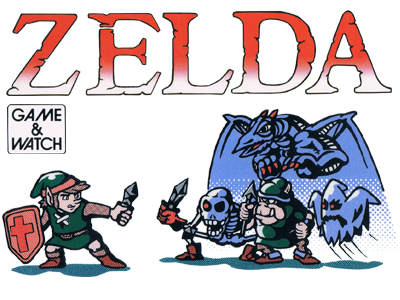 Zelda (Game and Watch) was Nintendo’s 1989 dual-screened entry into its Game & Watch series of handheld LCD games, and is actually the first handheld Zelda game ever made! The game featured two screens (similar in ways to the Nintendo DS) and had Link braving 8 dungeons in search of shards of the Triforce which would set Princess Zelda free from her evil Dragon captors. Zelda (Game and Watch) first appeared in its original form in 1989, but was rereleased in miniature form in 1998 as part of Nintendo’s Mini Classics LCD keychain games, and was recreated in 2002 as an unlockable game in Game & Watch Gallery 4 for the Game Boy Advance. Be sure to check out ZeldaPower for more great content related to the game and also check out the ZeldaPower YouTube Channel for some gameplay videos and other Zelda goodies. Have most of you heard of this rare Zelda title? Is there anybody out there that has actually played the Legend of Zelda Game and Watch? Please let us know by posting in the comments below!